Lori and I are enjoying a latté on an outdoor deck perched at the edge of the Jamison Valley, 270 metres up from the lush rainforest on the valley’s floor. We’ve seen this valley and the incredible Mount Solitary within it from just about every angle over the past few days, but I can’t imagine us ever getting tired of looking at it. “This is definitely one of the nicer vantage points,” I remark. Lori agrees. Scenic World (cnr Violet St & Cliff Drv, Katoomba / 02 4780 0200) is open every day of the year from 9am to 5pm. If planning to ascend out of the valley on the Scenic Railway, ensure that you’re back at its base by 4:50pm. The EATS270 cafe / restaurant is open from 10:30am to 3pm daily. 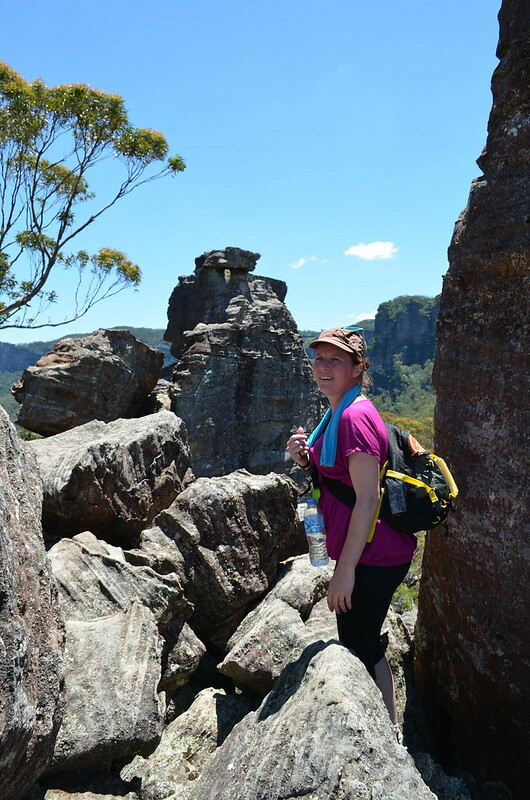 Lori and I did the Ruined Castle hike without a guide but if you’re not confident doing it this way, a guided tour is available and can be booked via my other website, AussieHikingTours.com. Time (hrs/min): 7 hrs 30 min. Grade: Moderate with one steep ascent. Maps: I’d recommend bringing a good quality topographic map, like Hema’s Katoomba 1:25,000. 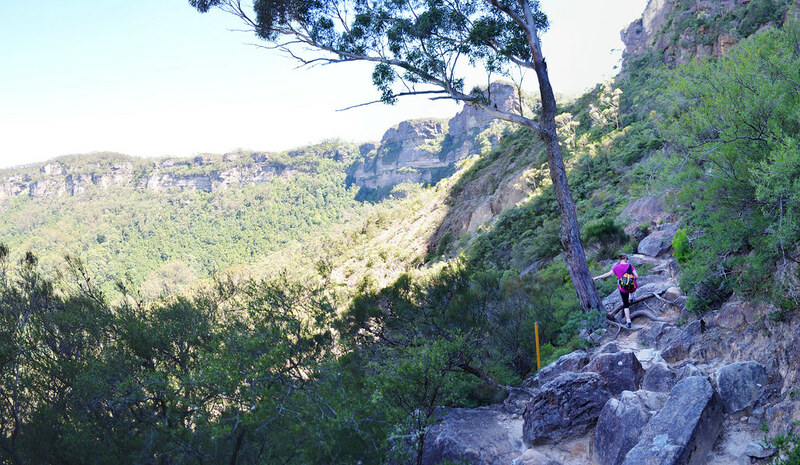 Car Access: The walk starts from Scenic World, which is on the corner of Violet Street and Cliff Drive in Katoomba. Follow the Scenic World signs from the main street. This deck is part of Scenic World’s EATS270 licensed café / restaurant, which features light snacks and full lunches made with seasonal produce from local suppliers where possible. We haven’t got time for eating right now, but we’ve organised a packed lunch. Scenic World, for those who don’t know, is probably the Blue Mountains’ most visited tourist attraction. 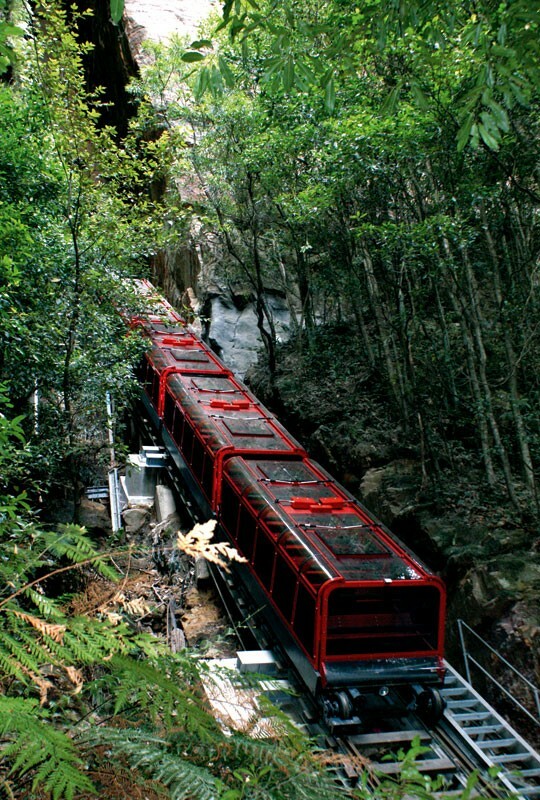 Apart from EATS270 and the gift shop, it offers a 2.4 km boardwalk through diverse rainforest vegetation, as well as the world’s steepest incline railway and two cable-cars – the Skyway, which takes visitors from cliff to cliff with glorious views of Katoomba Falls and the Three Sisters, and the Cableway, which offers an alternative ride to the Railway for access to the boardwalk below. Sitting opposite us is the lovely Anthea Hammon, joint Managing Director of Scenic World and winner of the 2014 NSW Young Achiever in Tourism Award. She and her brother David took the reins of the family business in 2011, from their father Philip. Before him, it was owned by his father, the famous Harry Hammon. 2015 marks 70 years since Harry first established Scenic World (known at the time as Katoomba Scenic Railway). Unsurprisingly, family is the overriding theme during our half-hour chat with Anthea. 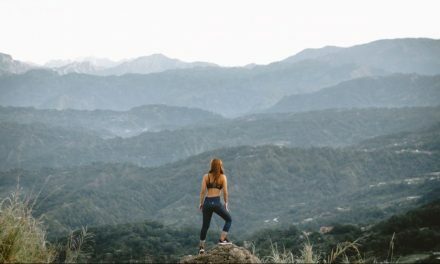 She’s delighted to answer our questions about the business, but more interesting are her tales of growing up with the Blue Mountains as her playground. I can’t think of anything better than getting our little family out for a hike like that together, which is one of the reasons I’m dragging Lori out on all these hikes with me. It’s part of my grand plan to gently ease her and the kids into this hiking bizzo. 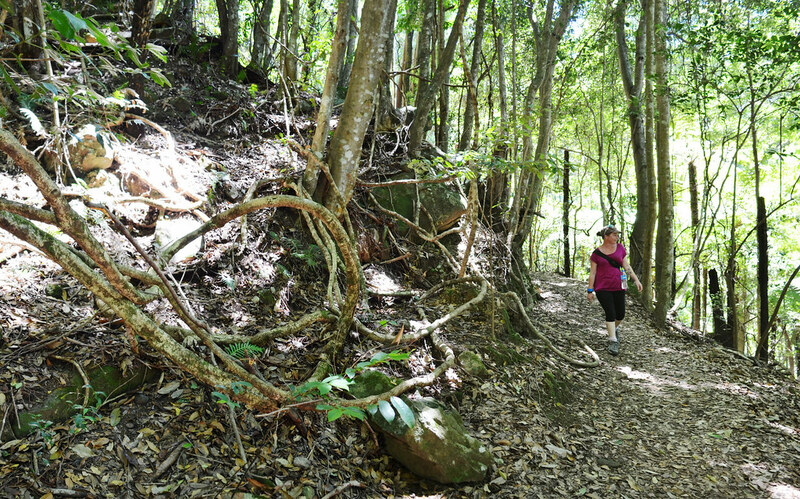 Our hike for today is from Scenic World to Ruined Castle, a 13 kilometre return trip. We’re planning to take the Scenic Railway down into the valley, and back out on our return. I’m sure we’ll be extremely grateful for it by the end of the day. Soon one of the EATS270 staff serve up our delicious-looking wraps, packed up nicely to fit in my backpack. We depart the Scenic Railway at Bottom Station and weave our way through a swarm of tourists, ducking under their criss-crossed selfie sticks. Heading south on the Scenic Walkway, we pass the old ventilation furnace and the entrance to an old coal mine before turning off the boardwalk onto a dirt track signed “Ruined Castle”. Though Lori is nervous about the length of the hike – the longest she’s ever done – her nerves fade quickly once we’re away from Scenic World, weaving between hanging rainforest vines and stepping over moss-covered fallen trees. One thing we’ve always had in common is our love of a good adventure, and that’s exactly how this hike feels. We chatter excitedly as we stroll along, and before long the dense vegetation opens up to an expansive view of the valley. Not far ahead, the track disappears into a massive boulder-strewn landslide. Anthea told us earlier about this spot – known by locals as simply The Landslide – which became a feature in 1931 when after a few days of rumbling, the cliffs above gave way, spreading themselves about a hundred metres out into the valley. Apparently there’s been much discussion ever since about its potential cause, most theories pointing to the impacts of the area’s mining history. The beginning of the Landslide traverse. When we arrive at the landslide, we follow what looks like a rough path but quickly find ourselves at a dead end, before realising that we should be following the strategically placed yellow posts. With that in mind, finding our way from here is easy. 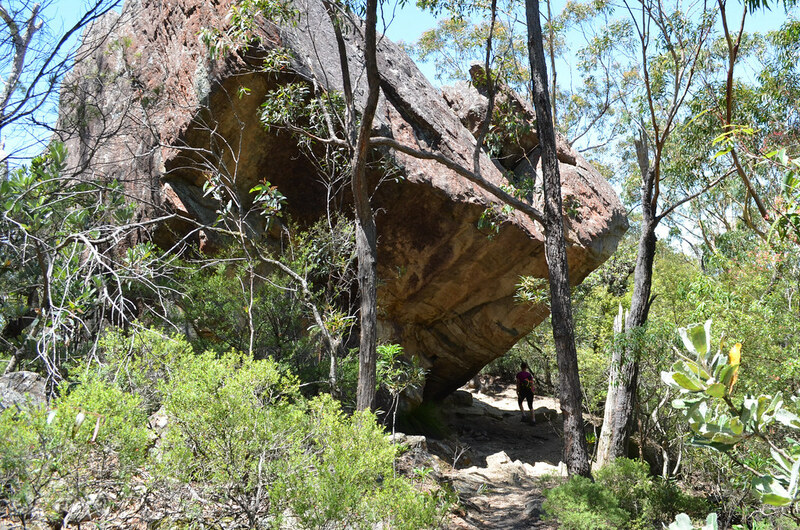 It’s definitely the trickiest part of the hike so far, but we enjoy the technicality of the rocky terrain, scrambling over huge sandstone slabs and carefully selecting our footing on each descent. Once we’re past The Landslide, rainforest surrounds us again. The day’s temperature is just starting to peak, so we appreciate the shadiness. We continue for another 4 kilometres, winding our way through bracken fern, tree ferns, vines, and coachwood, occasionally stopping to check out the views across the valley to the Three Sisters, through gaps in the vegetation. The rainforest is thick with tangled vines. Views of The Three Sisters can be enjoyed along the trail, through gaps in the vegetation. Lori is starting to fade now but she’s her usual determined self. Having not done much research on this walk, I’m a little surprised when we come to the bottom of an unexpected set of stairs. I’m not sure what to make of the look on Lori’s face, until a stream of expletives starts to pour uncontrollably from her mouth. I start the ascent and Lori follows closely behind, angrily swearing at the “f**king steps” as she climbs the steep valley side. We have regular rest stops but, although Lori’s swearing has ceased, I can tell she’s feeling on her last legs. I try to offer encouraging words along the way but mostly keep my mouth shut, worried I might make the battle in her head somehow worse. The track levels out as we reach the ridge-line, and soon we come to a large overhanging boulder where we take the opportunity to stop and rest for a few minutes in the shade. Continuing along the narrow ridge for another hundred metres or so, it seems like we’ve arrived at the base of Ruined Castle summit. Lori rests in the shade of a giant boulder near Ruined Castle. I decide to stop and eat my wrap, but Lori says she doesn’t feel like eating. As we sit on a rock beside the track, looking up at Ruined Castle’s rocky pinnacles, I notice that she’s got tears dripping down her cheeks. “What’s wrong?” I ask, moving over to give her a hug. I don’t know what to say, so I just hold her tightly until she stops crying. “Do you want to wait here while I go up?” I offer again. As we make the final scramble up onto the massive boulders of Ruined Castle, she tells me it’s just that ‘mind over matter’ thing, and she knows she can do it now. After a few more minutes checking out the views, Lori decides to get a head start on the descent while I take some photos. She’s back at the bottom of the “f**king stairs” before I catch up with her. “At least I’m not the only one,” Lori manages to spit out between fits of laughter. 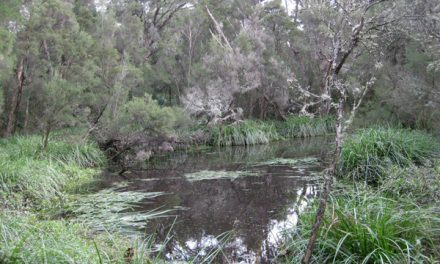 We set off back along the path, retracing our steps towards Scenic World. Lori is more cheerful now and I’m amazed by the pace she keeps. We power through the remainder of the walk in no time at all. Though we’re both pretty upbeat bythe time we arrive back at the Scenic Railway, I couldn’t have been more spot on when I thought we’d appreciate the ride out of the valley. Just the thought of taking on the Furber Steps again makes my legs ache. Back at EATS270, we grab ourselves another snack and a drink while we talk over the walk that was. On the way back to our hotel, she tells me she’s hungry for more. There’s still hope for my grand plan. 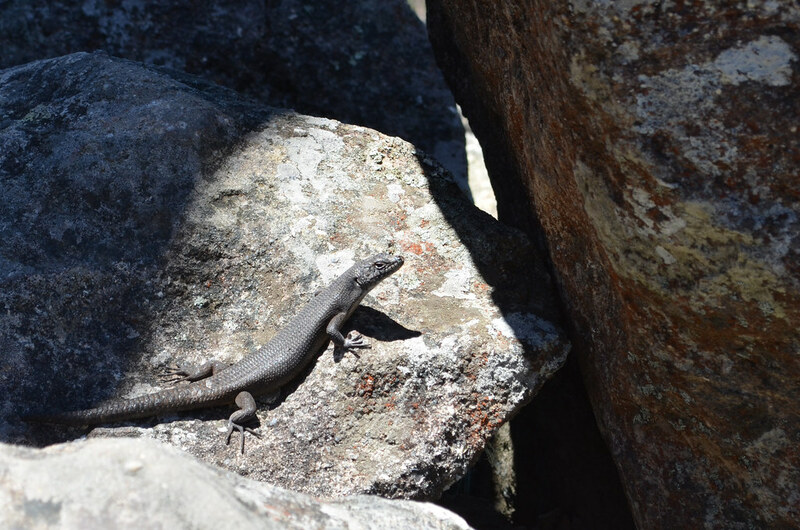 A lizard sunning itself at Ruined Castle. Lori checks out the views from atop Ruined Castle. The Landslide traverse is a little trickier on the return trip. Not keen to go it alone? 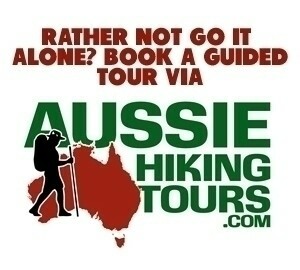 This hike is available as a guided tour, which you can book via my other website, AussieHikingTours.com. Have you checked out the Blue Mountains? 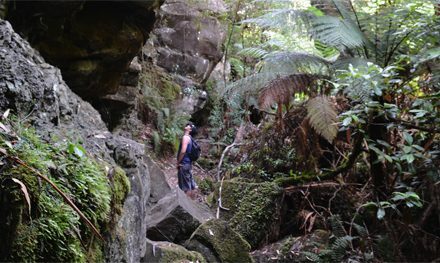 Visited Scenic World or hiked Ruined Castle? Do you have an experience with High n’ Wild Adventures? If you’ve got any tips or tales to tell, please let us know by commenting below. This is one of my favourite walks! I have done it around 30 times as I live nearby, but I start from the Golden Stairs rather than the Scenic Railway. It shortens the round trip by about 5km but means you finish with a steep climb out. I always look out for the lizard at the top…he LOVES sultanas, so I usually throw him a couple. 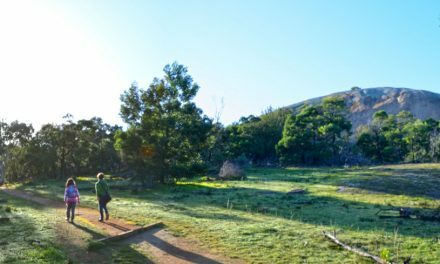 Anyone doing this walk should listen for the lyrebirds that are near the Golden Stairs turnoff….they can nearly always be heard in full, exuberant song. It makes my heart sing every time. Thanks for the lizard and lyrebird tips! I will keep an eye/ear out next time. 🙂 U appreciate you stopping by. Well done Lori for not giving up! I know that feeling – it’s usually when I’m tired, low on energy and need to eat something. Of course there will be ups and downs, but hopefully the bushwalking bug has bitten (or at least started to bite) now! Shawn and I did this hike in September 2013, a week or so before our wedding at Solitary Restaurant on Cliff Road in Leura/Katoomba. It’s one of my favourite hikes. I was super fit at the time we did it (pre wedding fitness hahaha), but Shawn could really empathise with poor Lori! He was still smoking at the time, and that incline towards the end nearly did him in. ANd he had to put up with me being all “we’re so close, we’re nearly there!” every 20 minutes lol. Yeah, Scenic World is very cool. I find the history of it really fascinating. Considering the mines, the area could be a looking a lot worse. Gorgeous spot! Thanks Amanda! Yeah, we get plenty of opposition from the kidlet but Lori is always keen to give anything a go. If anything, I hesitate to get her out hiking too much for fear of putting her off by making her go too hard. She was out for a hike 4 days out of our 6 in the Blueys though, and she did really well!